Den, Trexus and RAL like this. Really, really crazy just how close they are to the concept. I can't recall the last time that translation from concept to production was this thin. What's the guess in price 80k? 90k base? brb, going to buy more powerball tickets... sigh. I was thinking the same! Even the same, Amazing, rims! The new interior seems to be where they hit a real home run, but the new Mercedes GT is also excellent. 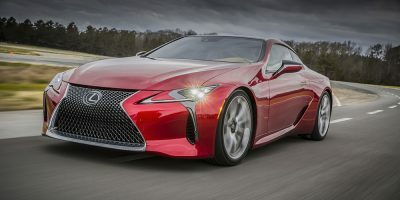 1- what would make the LC 500 faster than RC F? I mean they use the same engine despite it is lighter or there are another elements (it sounds stupid question sorry)? 2- 0-60 MPH in less than 4.5 seconds? It looks so sporty I mean it should be way below 4.5 or it is not the official numbers yet? 3- When is it going to be available? Price? 4- LC F? LC H? I love it sooo muchhh!!!! Well done Lexus! Lol, just work hard and save buddy. Do some uber. RAL and oem_is300 like this. I was expecting it to be similar to the concept, but im still impressed. The interior is world class. 6 Series and S Class Coupe finally have a challenger from Lexus! Put mine on layaway financing plan. TPW TBD. Only 95 more payments! Is this the FSport model? I find this so much better than the concept! It is so beautiful and definitely motivation for a college student like me to work hard to buy one of these! I mean we waited four years for this and Lexus delivered it better than I could ever imagine. Honestly, NSX who? SClass Coupe who? 6 Series who? 911 who? The LC wins this category by a long shot. RAL and corradoMR2 like this. This is a clear statement of Lexus, the emotion factor is now in the top drawer! And even the big boss now occurs in the foreground, in English. Born2Drive, RAL and corradoMR2 like this. Hoping for $90K USD but this car looks a LOT more expensive and can easily be justified at 110-120K in my mind. Interestingly enough, I can see why you mention this because of the grille, but no badging of it whatsoever. But this brings up an interesting topic of discussion. Should the LC be offered in F Sport? Personally, I'd skip an F Sport package offering on this car since it already is a "premium and sporty GT" as it is, instead simply have an LC (as we see here) and LC F. F Sport would cheapen the lineup in my opinion if this makes any sense since. RAL and DDas like this.